Few controllers are as universally loved as the original GameCube controller. With multiple joysticks, an unusually responsive D-Pad, and two full rows of shoulder buttons, it provides a huge number of different inputs. More than many controllers, both before and since its release. Which is a small part of the reason why some people still prefer GameCube controllers to this day. But getting your old GameCube controllers to work on modern machines? That can be tricky. Especially if you’re not simply trying to just emulate an older controller, but you want to actually use older controllers. 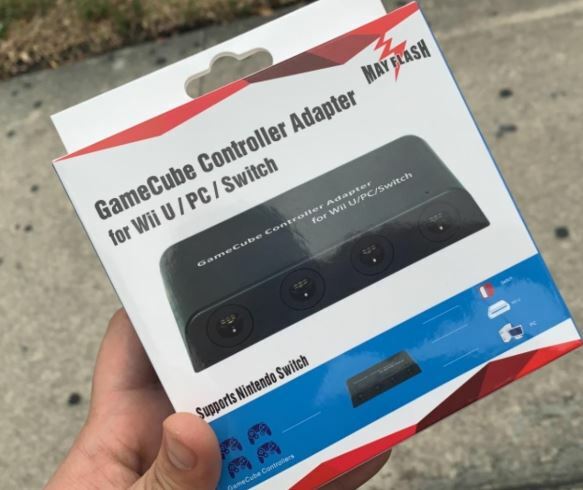 Selecting a great GameCube controller adapter is really just a matter of running through some common sense considerations. For instance, are you only concerned with adapting one controller, or do you want to enable multiplayer? Walking through a couple of simple questions like that, it’s easy to narrow down your selection to the most appropriate adapter. Can the controller be used Windows? What about Mac? How about adapting to the Nintendo Switch? Different GameCube controller adapters will unlock different possibilities. Opening more doors doesn’t necessarily cost much more, which can be handy if you happen to have a couple of old controllers or adapters lying around already. How many different controllers are supported? Can the adapter take on the SNES, NES, or Wavebird controllers? Is it able to accommodate newer editions of controllers, like rereleased versions of the GameCube controller? Just because you can plug in the controller doesn’t mean it’s going to work, especially when you’re trying to connect newer versions of older controllers. Be sure to read the fine print when it comes to controller compatibility. Some adapters will allow you to take your wired controllers over to wireless signals, which can be useful if you’re trying to connect to a Nintendo Switch in particular. That can be handy, but it also means you’ll have to think about a power source for the wireless transmitter. Other adapters keep you wireless, and will allow you to use more than one controller, instead unlocking a full set of multiplayer options. When you’re choosing a multi-port adapter, the magic number is four. Four ports will let you play essentially any multiplayer game out there. After all, it matches up with the original number of ports on the GameCube. But if you’re looking to do something fancy, like an 8-player network, some types of equipment can actually support that – provided the game you’re playing can also support it. Every adapter will require some kind of power source. Wireless adapters will typically use some kind of battery, while wired adapters more often make use of USB. More often than not, power cables run about five or six feet, which is sufficient for plugging in a couple of controllers. But be on the lookout for shorter cables, especially when you’re choosing in the $20-$40 price range. 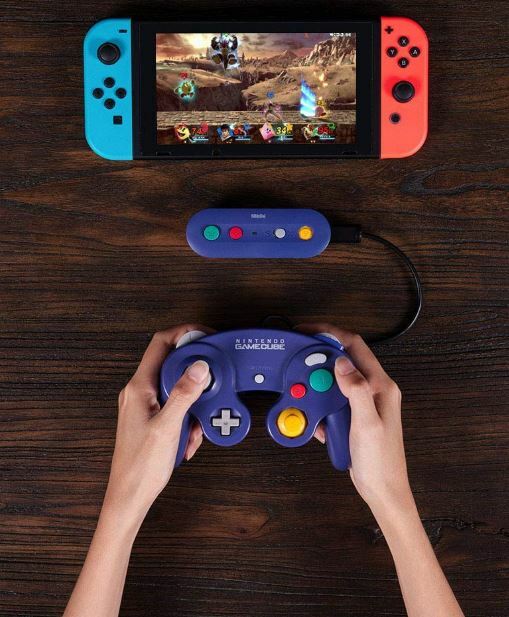 The Mayflash GameCube Controller Adapter isn’t exactly a Nintendo Switch adapter. It’s made to be toggled between operation of the Wii U and PC. Moving between modes is as simple as hitting a small switch on the side of the unit. But getting everything to run smoothly? That’s where this adapter really stands out. 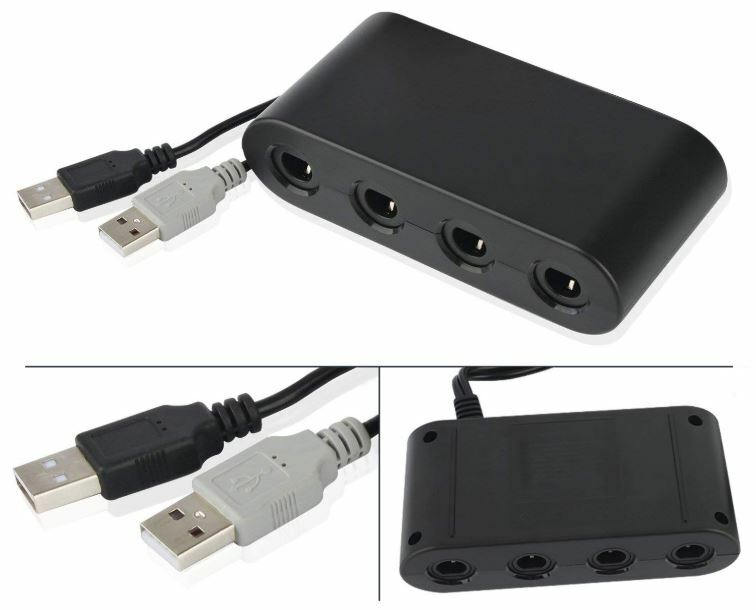 As you can tell from a glance, this adapter lets you connect as many as four controllers. All of the controller ports are reasonably well made, and do a good job of holding on to your cables while they are plugged in. That generally strong ease of use only continues to build as you delve deeper into examining the adapter. Mayflash’s adapter measures 5 x 4 x 1 inches, and weighs about 6.4 ounces. A reasonably portable design, made marginally less potable by the attached USB cables, which run about five feet long. The side of the adapter provides just enough space for four GameCube controller ports. Unfortunately, the black chassis is terribly bland from an aesthetic point of view. If the top of the device didn’t literally explain what this adapter is, many people would have a hard time identifying it. It looks like it could be just about anything, though knowing what a GameCube port looks like does give it away. If you don’t actually plan on moving between different platforms, like moving to the Wii or PC, then you might want to tape the switch in place. It’s somewhat easy to accidentally nudge the switch, and then start encountering tech issues. Because you didn’t notice you hit the small mode switch, you generally don’t think to look there. 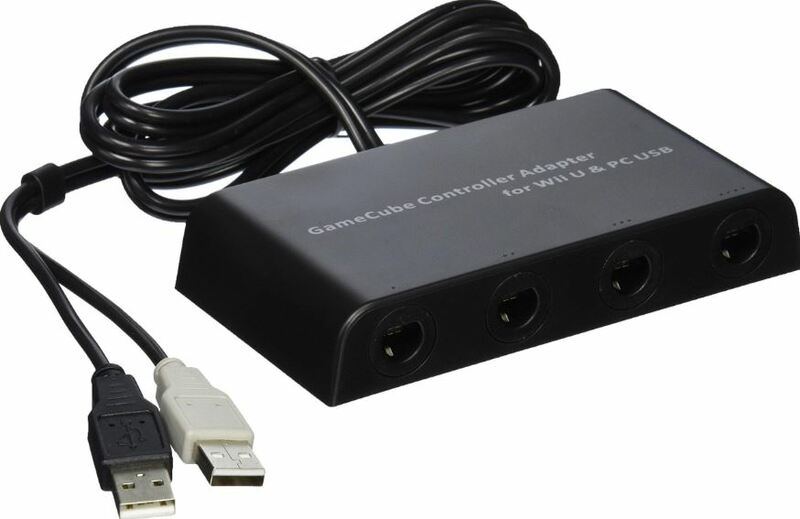 The Mayflash GameCube Controller Adapter also supports the vibration feedback that’s native to GameCube controllers. It provides two USB ports for the use of game adapters. It’s compatible with Windows XP, Vista, 7, 8, and 10. It’s also compatible with Mac OS. But in order to get the vibration feature to work on PC, you’ll need to go through an extra step. You’ve got to install the drivers necessary for that non-native feature to operate properly. 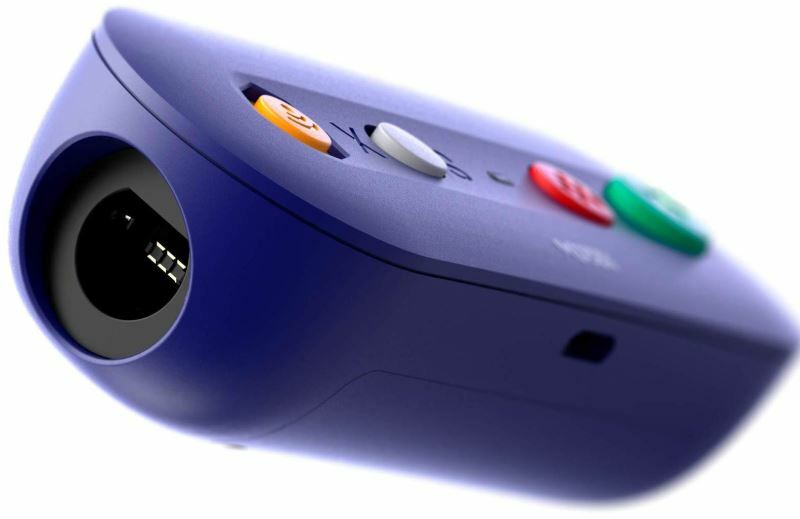 The Y-Team Wii U GameCube Controller Adapter is almost identical to the Mayflash adapter. It has one advantage which should be immediately obvious, it doesn’t look like garbage. Though the Mayflash adapter is built reasonably well, the chassis does look like cheap garbage. By contrast, the Y-Team adapter uses a smooth matte finish that keeps their adapter looking modern and professional. Of course, it’s not all about looks. This adapter also supports Wavebird controllers, and a chip that can be toggled between supporting the Wii, PC, Mac, and the Nintendo Switch. Just throw the switch on the side of the adapter, and you move between platforms in an instant. The Y-TEAM adapter measures 4.5 x 1.2 x 2.1 inches, and weighs just over two ounces. Pretty portable, though slightly more tedious to carry around when you start to account for the attached cables. It’s a pair of USB cables, which run about six feet. Even though this adapter is pretty stylish, it’s also fairly non-descript. There aren’t any logos or branding that immediately help someone to identify it. On the backside, there’s a Wii U/PC Switch to help clue you in, but that’s it. Similar to the Mayflash adapter, this adapter allows you to add four additional ports. You have to connect with a pair of USB cables to get the full functionality out of all four ports, but finding a pair of USB ports typically isn’t that tough. Most gamers don’t have to worry about controller latency. But when you start stacking controllers behind adapters, you’re slowing everything down. This adapter actually manages latency exceptionally well, probably because of the USB connection. In either case, it’s perfect for playing games like Smash Bros because there’s no added latency in the controller. It’s capable of supporting vibration, you’ll need to connect the gray USB cable to get it. No installation drivers are necessary to play on PC. However, you’ll need to download some drivers if you hope to get those vibration features to work on the PC platform. This adapter includes a user manual, but this device is intuitive enough to use without having to resort to the manual. It also includes a one-year warranty. You probably won’t need the warranty because devices like this don’t involve moving parts. Provided you don’t go out of your way to cook the adapter with extra heat, it’s easy to imagine it lasting as long as classic GameCube controllers. The 8Bitdo Gbros. Adapter isn’t for someone who’s trying to play with three friends. It’s an adapter built to serve a single controller, and help convert older analogue controllers into modern wireless ones. On either end of the adapter, you’ll find controller ports, capable of helping move classic Nintendo controllers to a wireless signal that can be picked up by the Switch. Wired connections will probably always be faster than wireless ones, even if the difference is minuscule. The wireless connectivity behind this adapter is pretty similar to Wavebird controllers, fairly pristine. Though, there are drawbacks to that excellent connection when you start to examine the battery life. This adapter measures 4.1 x 1.1 x 1.4 inches and weighs about 1.6 ounces, making it reasonably lightweight and portable. Either side of the device contains a deep controller port, which can be used for taking a variety of different controllers into modern games. Once you’ve connected, you can play your Switch with an NES, SNES, or Wii Classic remote without issue. And of course, with a GameCube controller. Aesthetically speaking, the 8Bitdo Gbros adapter looks the most like game hardware. The bright purple chassis of this adapter closely matches the original color scheme of the GameCube and its associated controllers. 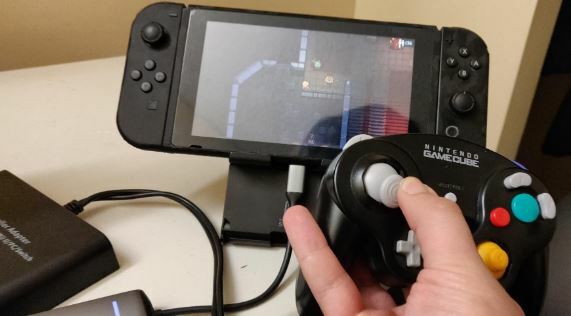 The front of the adapter provides a four button configuration, which allows you enter the home screen and initiate a screenshot, and switch between the Switch and PC platforms. If you hope to connect with a PC, this adapter requires Windows 7 or later. Regardless of what you hope to connect the adapter with, before getting started, there’s a firmware update on the 8Bitdo Gbros website that you should consider grabbing. One thing to keep in mind. 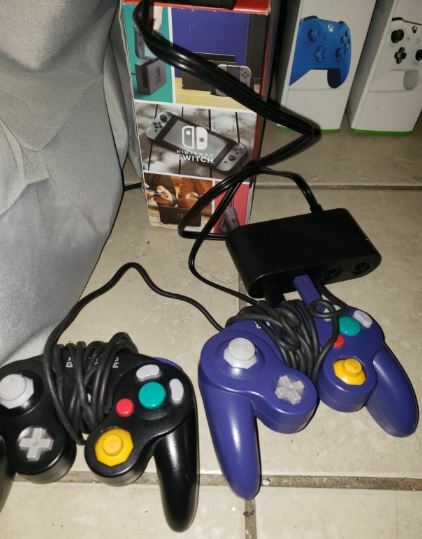 You need actual old-school GameCube controllers for this adapter to work, you cannot use updated Smash Bros edition GameCube controllers. 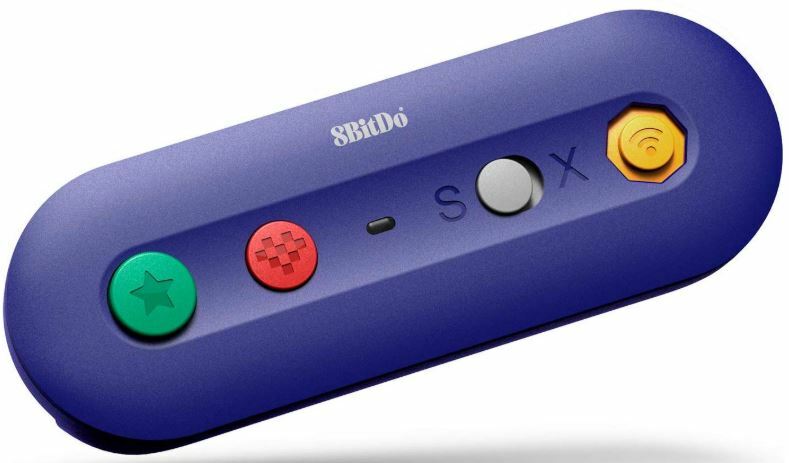 If you have a GameCube controller that was made in the past two or three years, it’s unlikely the 8Bitdo Gbros. Wireless Adapter will help you. In addition to the Switch adapter, this kit includes a cable band which can be used to manage the attached USB cabling. It also includes a USB cable and user manual. It does not include two AA batteries, which are necessary for operation. Once you’ve got a good pair of batteries inside, you can expect about 30-hours of gameplay time before you need to swap them out. That’s not bad, though it’s certainly understandable that it will annoy some people. Rechargeable lithium-ion batteries are so common now that devices which require AA’s can feel antiquated. Though in fairness, if this adapter had included a battery inside, it would’ve ended up costing twice as much. Having a built-in battery would’ve also put a finite lifespan on the product, ensuring it would be useless within five years. 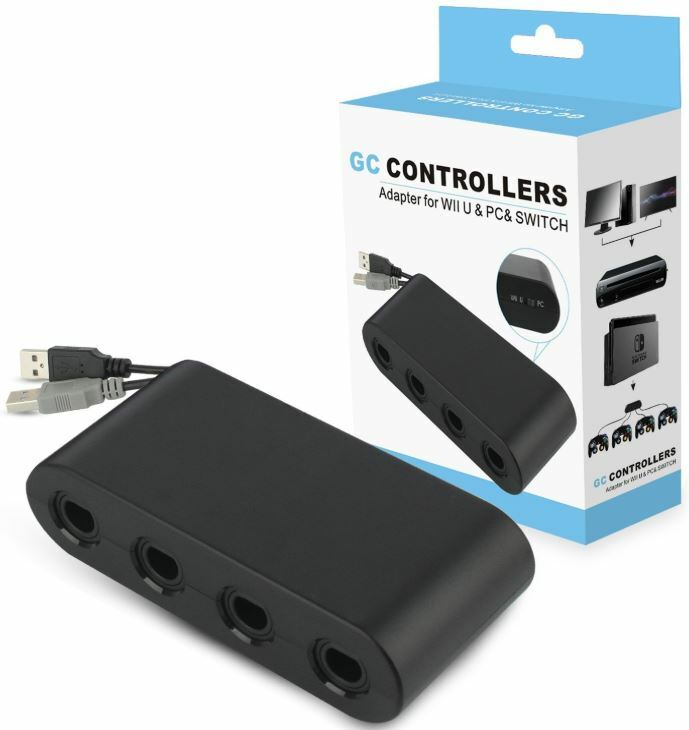 The Mayflash GameCube Controller Adapter is cheap and simple. It’s not very pretty. The plastic looks like it was probably pulled from recycled VCRs. But it gets the job done with minimal lag, minimal cost, and minimal installation difficulty. That makes it a good choice for someone who’s primarily interested in playing on the Wii U and PC. 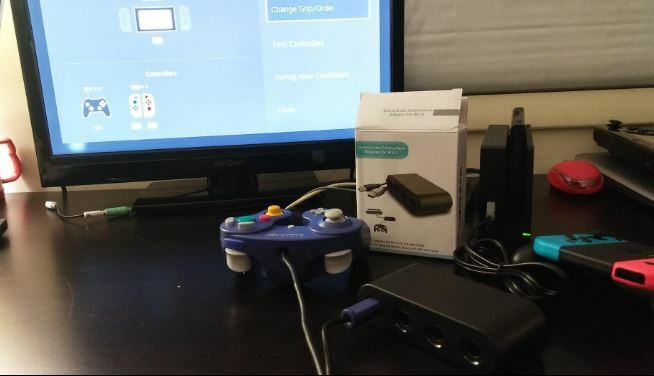 The Y-TEAM Wii U GameCube Controller Adapter looks a little sharper than the Mayflash adapter, and they’re actually pretty close in terms of functionality. But the Y-TEAM adapter can adapt controllers for the Wii, Nintendo Switch, PC, and Mac. Handling both classic controllers and a Wavebird controller, this layout is a great choice for someone who intends to use more than one controller, platform, or format. Finally, there’s the 8Bitdo Gbros. Adapter for Nintendo Switch. For people who are to make one of their classic controllers into a wireless PC/Switch controller, there’s plenty to like about this adapter. It’s highly functional, intuitive, and it even aesthetically matches up with the old GameCube look. That makes this the right call for someone who’s only trying to adapt a single controller for a single player.